The Invicta Men's Pro Diver Collection Stainless Steel watch is designed for avid deep-sea divers, with a water resistance of 330 feet. 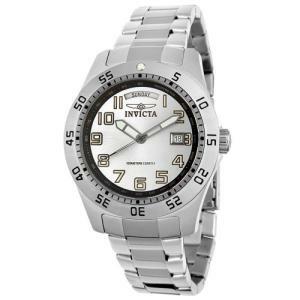 Constructed with a stainless steel case, this durably built timepiece also includes a unidirectional stainless steel bezel, and a stainless steel link bracelet with a single-push-button-safety-fold-over clasp. A durable sapphire-coated mineral crystal shields the white dial face, which features Arabic numeral hour indexes encircled by a black tachymeter. The dial face also includes a day calendar at the 12 o'clock position and a date calendar at three o'clock. This Swiss-quartz-powered timepiece is presented in a handsome yellow presentation box.